Travel to Sabang, how am I going to get there? Travel to Sabang, do you know where it is? Where is Sabang Puerto Galera? You can find Sabang in the province of Oriental Mindoro on the northern tip of the island Mindoro. Lot's of Mindoro's, but that is where it is! It lies roughly 130 kilometres from the Philippines capital Manila. It is also pretty much due south from Batangas, which is on the main island of Luzon, the same island where you will find Manila. Puerto Galera is a general term used for the whole area, Puerto Galera itself is a port town, not much to see. It is however one of the main spots for you to get off your ferry. From here you can either catch a jeepney to either Sabang or White Beach. Both of these areas are in totally opposite directions. Sabang is one of three beach areas and is where all the nightlife and entertainment is. The other beaches are Small La Laguna Beach and Big La Laguna Beach. To be fair, the only decent beach of the three, is Big La Laguna Beach, which is the furthest from Sabang. Travel to Sabang - How do I get to Sabang Puerto Galera? Whether you like it or not you will need to travel by road and some type of ferry to get to Sabang, there is just no other way of getting to Sabang. Now the trip itself will start in Manila, you do have a couple of options depending on your budget and time restrictions. Personally when I head down to Sabang in Puerto Galera I'm usually on a tight time frame so I like to get there as quick as I can and there is really only one way to do it quick. I hire a mini van or car to take me directly to Batangas Pier and then a private banca or boat to take me literally to the front door step of my hotel, right on the beach. Click here to organise your own Travel to Sabang private transport. For more information on how to get to Puerto Galera have a look here. If you are on a budget, once you have made it to Batangas Pier, (have a look at the above link for bus options to Batangas City) there are a number of ferries that will take you to Sabang Beach, but you have to get yourself to the Batangas Pier, everyone knows where it is so you will not have any problems finding it. Travel to Sabang will start from Manila by road to Batangas Pier, this leg of the journey will take you around two to three hours, sometimes more depending on traffic and time of day. The trip across from Batangas to Puerto Galera crosses the Verde Passage, which at times can be quite rough, depending on what the tide is doing. Be sure to wear shorts with footwear you can either take off or you don't mind getting wet because when you get off the banca chances are you will have to get your feet wet. The way you get on and off banca's is by a narrow plank at the bow or front of the boat, generally the plank will either just reach the beach above the water or will be in the water. Sometimes if you are lucky and female, the boatman may carry you, just flash your pearly whites and look innocent, I'm sure you know how! Okay if you arrive via one of the ferries and have landed in Muelle Bay, which is the main port in Puerto Galera, you are not there yet. You have two options to travel to Sabang. Your first option is to catch the jeepney. 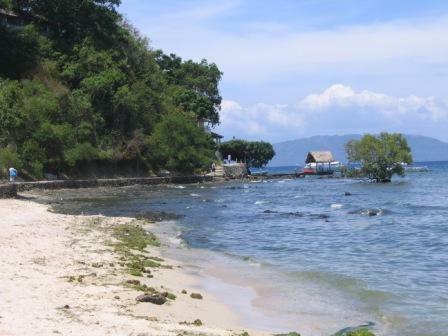 It winds its way round all the coves and bays for about half an hour until you arrive in Sabang. A good portion of the road is unsealed and can be quite muddy during storms and heavy rain. Once the jeepney is bogged in the mud it is time for all hands to get out and push, expect to get a bit muddy, don't worry it is all part of the experience, your on holidays, chill, relax your in paradise! Your second option getting to Sabang is by banca. These boats will take you from the wharf directly to your hotel, more often than not if you have pre-booked accommodation, the hotel will organise a banca to meet you at the wharf. This is the easiest way to get to Sabang or any of the other beaches in Puerto Galera and I think it is the nicest, you get a first up view of the incredible beauty that Puerto Galera has to offer. Now that you have arrived, where are you going to stay? Have a look here for my recommendations on where to stay. Right, now you have sorted out your accommodation, what else is there to do? 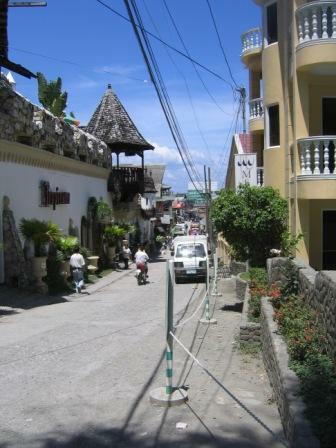 Have a look here for what Sabang is like, you know nightlife, restaurant etc. If you would like to cut out all the public transport options of getting yourself to Sabang, Puerto Galera, then fill out this form to see how much it will cost you. Remember the more travelers the cheaper the price. Are you arriving by plane? If so what is the flight number? If you have entered Other, Where?